ESPN personality Stephen A. Smith has been roasted by Twitter users for his questionable take while previewing a key NFL match up on his show First Take. Within the space of 30 seconds, Smith made several mistakes leaving his co-host and guest Tedy Bruschi dumbfounded. 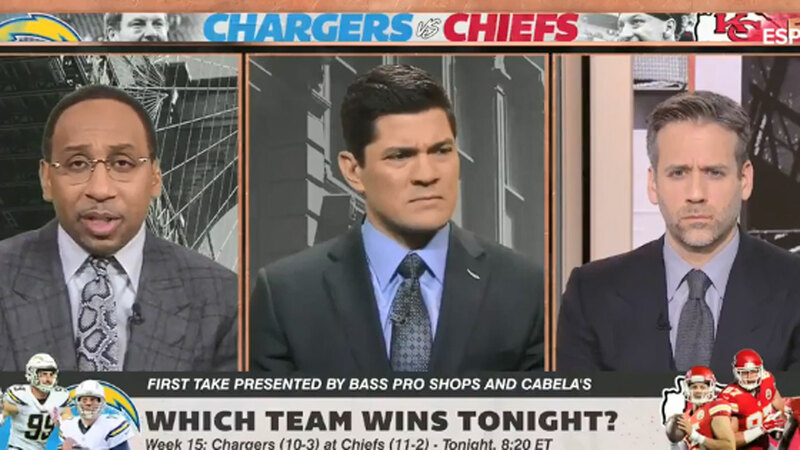 Stephen A. was breaking down the AFC match between the Chiefs and Chargers and started talking about who the key players were in the clash, and began by detailing why the Chiefs running back is a danger man for the Chargers. As he tried to continue, Smith was interrupted by his co-host Max Kellerman to remind him that Ware hadn’t practiced all week to due issues with his shoulder and hamstring. But he wasn’t done there, with the popular commentator dropping another doosy. The Chargers no longer play in San Diego and moved to Los Angeles this season but Kellerman and guest, former Patriots linebacker Bruschi let it go, probably because everybody at some point has had a slip of the tongue with the team’s new home. “I’m thinking about Hunter Henry and the way he’s played this year and as effective as he’s been,’’ Smith said. Only problem is that Henry tore his ACL during the preseason in May and has missed the entire season. “He’s going against Derrick Johnson. I got my eyes on that,” he said. No, Stephen A, Johnson isn’t playing for the Chiefs anymore, he was let go by the team earlier this year and moved to Oakland to play for the Raiders, who eventually released him. Twitter users let Smith have it for his fake take. Smith explained why he wasn’t himself on social media. “My Brother, it’s called a MISTAKE because I was think of Virgil Green, but mentioned Hunter because I was multi-tasking,” he said in response to the tweet highlighting the errors.